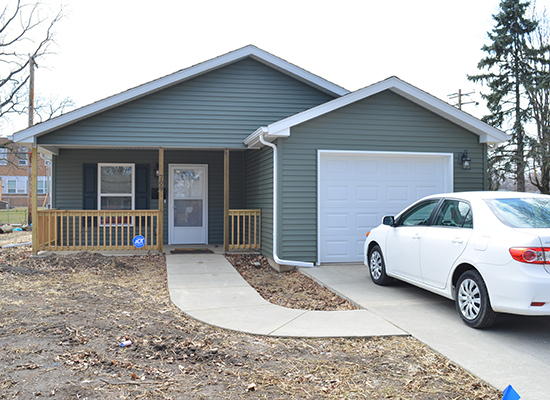 Community support helped the Barmaki family achieve homeownership. Raising five children in a small two-story apartment is difficult. It’s especially challenging when one of them uses a wheelchair. Jaouad and Hoda Barmaki had to carry their daughter Bayan up and down the steps to access the bathroom and her bedroom. 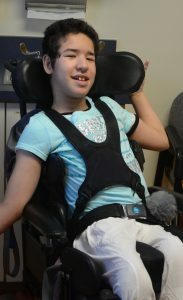 Bayan, 11, is unable to walk due to scoliosis, cerebral palsy and other health conditions. This challenge was daily life until the Barmakis applied for Habitat for Humanity of Champaign County’s homeownership program. With Habitat’s help and community support, the Barmakis now have a brand-new one-story home that’s fully accessible for Bayan’s needs. Jaouad and Hoda moved from Morocco to Champaign, where they got married and started a family. Bayan is their oldest child. Bayan became enrolled with the University of Illinois at Chicago’s Division of Specialized Care for Children (DSCC) shortly after birth. Jaouad said DSCC’s support has been extremely helpful for his family, especially when he faced language barriers when communicating with certain providers. 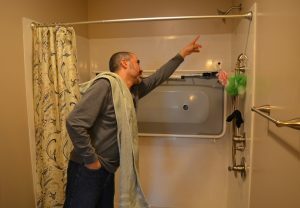 Jaouad Barmaki explains how the shower lift works in his family’s new, accessible bathroom. After Habitat accepted the Barmakis’ application, the family’s DSCC Care Coordinator Dan Beagles and Bayan’s school physical therapist helped provide input on the building plans. 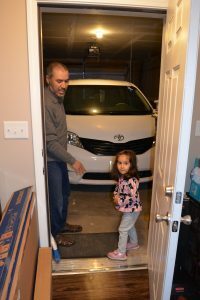 The Barmakis’ new home has zero-step entrances and a more spacious floor plan to make it easier for Bayan’s wheelchair to navigate. Her bedroom has a widened doorway, and the bathroom features a roll-in shower with a lift. The new home is also located near the Barmaki children’s schools and has plenty of yard space for the kids to play outside. Jaouad Barmaki points out the zero-step entrance from the garage into his family’s new home. Habitat ReStore and working on the build site. They moved into the house on March 7. Local news outlets, including WCIA 3 News and Smile Politely magazine, covered the house’s dedication. Jaouad recently took Dan on a house tour during one of Dan’s regular home visits with the family. He said everyone involved in the building process was very helpful and his family is deeply grateful. Dan enjoyed seeing the finished house and how it’s improved their quality of life.